This entry was posted in blog, Cross River NY, Lewisboro and tagged Cross river NY Luxury Homes for Sale on January 6, 2018 by Robert Paul. Torsten Slok, Ph.D., is chief international economist and a managing director at Deutsche Bank Securities. The question Slok asked yesterday morning was this. Is household formation dropping because of affordability? 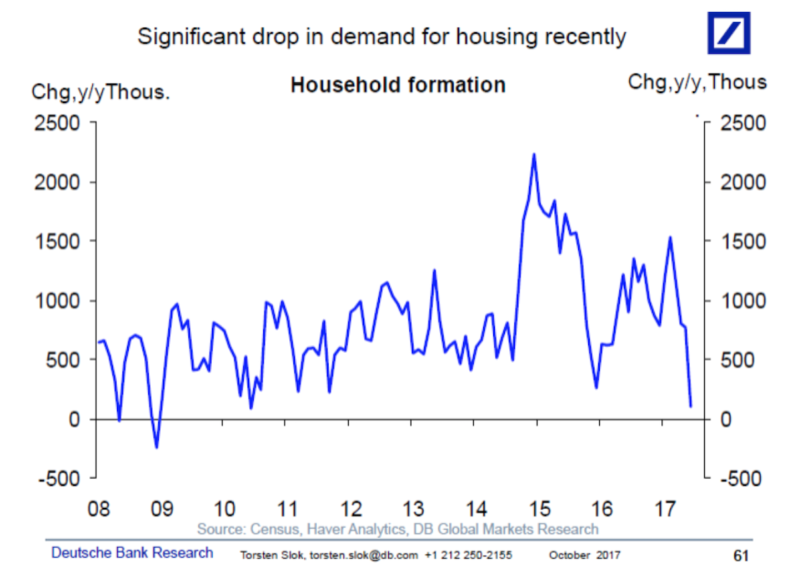 Household formation takes a dive. Why? It shows household formations falling off the table in 2017. Dr. Slok looks at the data and sees a big red flag. In the initial years after the crisis household formation was around 600k to 700k, see chart below. Then household formation jumped to +1mn as young people completed their education and started moving out of their parents’ basement. But recently we have seen a significant drop in the number of new households, and we are worried that the slowdown in housing demand is driven by very high home prices and housing simply becoming unaffordable for new families. The dots Slok inferrentially connects bridge this observation about national economics’ basic building block–the household–and the performance of the broader economy itself. To be sure, the housing market remains a small share of the overall economy, but it is important because it is one of the most cyclical components of GDP. For a clue into this unsettling flash point, one might look deep into the insights brought to light last week in an analysis from New York University’s Furman Center. On the surface, the headline take-away is encouraging, noting as it does that the percentage of United States households who are rent-burdened–spending 30% or more of their wages on monthly housing costs–fell by a percentage point between 2012 and 2015. The report explores a relatively new phenomenon–more wealthy and higher-educated people are choosing to rent–that partly accounts for this statistical shift to fewer rent-burdened households. 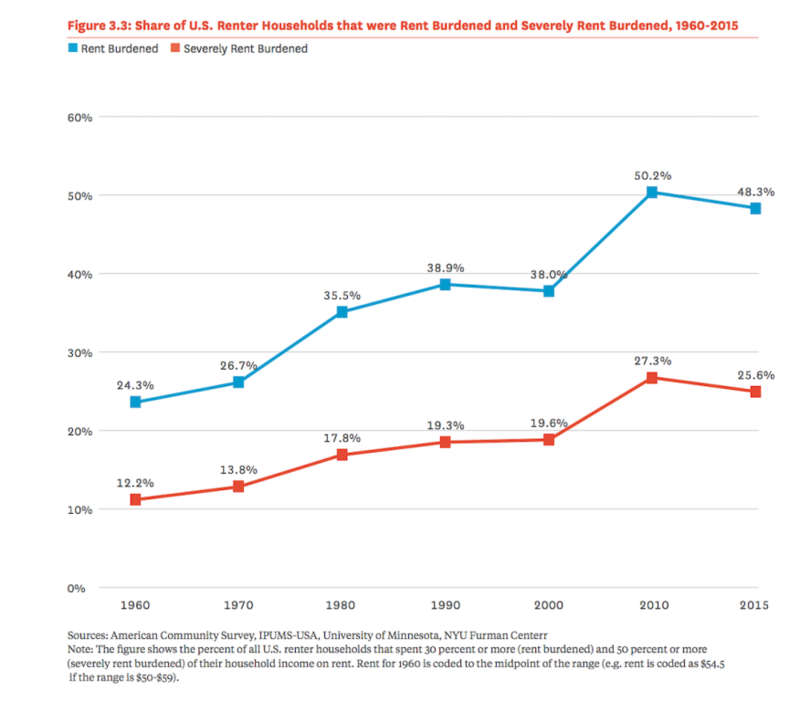 The income of the typical renter household increased along with overall incomes in the economic recovery period, but more of the renter households were highly educated, had higher incomes, and were employed. Therefore, not all of the measured increase in renter income was due to renters making more income per se; rather, part of it was due to a shift in who was choosing to rent. It’s here that we might discover insight into how the two trends–a slower household formation growth due to less affordability in many places, and the slight improvement in the share of rent-burdened households. It’s evidence vested and invested players in residential real estate development and construction are working in not one, but two, related but disconnected housing businesses. In one part of the housing business, players are growing around their competence at asking people with means how it is they want to live in their homes and communities, and profitably developing, designing, engineering, building, and marketing neighborhoods that answer to those preferences profitably. This entry was posted in Cross River NY and tagged Cross river NY Luxury Homes for Sale on October 23, 2017 by Robert Paul. The Department of Labor announced today it has withdrawn informal guidance that was widely regarded as an Obama Administration crackdown on companies’ use of independent contractors and of workers who in effect are employed by two companies jointly. Of those, the 2015 guidance on independent subcontractors raised the greatest concerns among remodelers because it could have forced companies to treat those subs as employees and thus pay payroll taxes, unemployment insurance, and related costs on those workers. The July 15, 2015, administrator’s interpretation by the head of the Wage and Hour Division–which no longer is available on the department’s website–basically declared the government will be looking closer at a subcontractor’s economic independence when deciding whether that sub really ought to be regarded as an independent enterprise. That represented a shift from past practices in which government reviews appeared to focus on whether a company controlled a supposedly independent contractor by setting that person’s hours, providing tools, and requiring the contractor wear the company’s uniform. The joint employer rule basically involves whether one company effectively controls all the activities of another company and thus is responsible for what that second company does to its employees. The rule had multiple implications for cases in which contractors used subcontractors and companies related to franchises. This entry was posted in Cross River NY, Lewisboro, Westchester NY and tagged Cross River Luxury Real Estate, Cross River NY Homes, Cross river NY Luxury Homes for Sale on June 15, 2017 by Robert Paul. This entry was posted in Cross River NY and tagged Cross River NY Homes, Cross river NY Luxury Homes for Sale, Cross River Real Estate for sale on June 7, 2017 by Robert Paul. New home sales plummeted from last month, however the level of housing inventory showed improvement, according to a joint release from the U.S. Census Bureau and the U.S. Department of Housing and Urban Development. Sales of new single-family homes in April came in at a seasonally adjusted rate of 569,000 sales, a decrease of 11.4% from last month’s 642,000 sales. However, this is up 0.5% from last year’s 566,000 sales. Brent Nyitray, iServe Residential Lending director of capital markets, pointed out in his note to clients that new home sales are still lagging behind population growth. Surprisingly, the median sales price dropped to $309,200, down from last month’s $315,100. The seasonally adjusted estimate of new homes for sale at the end of April remained steady at 268,000 homes. But with the lower rate of sales, this represents a 5.7-month supply of homes, up from 5.4 months in March. While falling home prices and an increase in inventory could show a cooling housing market, time will tell if this was a one-month drop or a new trend. This entry was posted in Cross River NY and tagged Cross river NY Luxury Homes for Sale, Cross River NY Real Estate, Cross River NY Realtor on May 24, 2017 by Robert Paul. The first quarter of 2017 saw the strongest quarterly home sales pace in a decade, according to the latest quarterly report from the National Association of Realtors. This increase in home sales put downward pressure on housing inventory levels and caused home prices growth to accelerate its rate of increase in the first quarter, the report states. In fact, metro home prices now accelerated for three consecutive quarters. The national median home price increased to $232,100, up 6.9% from the first quarter of 2016. This represents the fastest rate of growth since the second quarter of 2015. Single family home prices increased in 85% of markets as 152 of 178 metropolitan statistical areas showed sales prices gains in the first quarter, the report states. However, in 14 MSAs, home prices decreased year-over-year. Total existing home sales, including single-family homes and condos, increased 1.4% in the first quarter to a seasonally adjusted rate of 5.62 million, the highest rate since the first quarter of 2007. This is up from 5.55 million in the fourth quarter of 2016 and from 5.36 million in the first quarter of 2016. Housing inventory, however, decreased 6.6% from 1.96 million homes for sale in the first quarter last year to 1.83 million this year. This average supply rested at 3.7 months in the first quarter, down from 4.2 months last year. And while median income is increasing,, hitting a national average of $71,201, higher mortgage rates and home prices weakened affordability. This entry was posted in Cross River NY and tagged Cross River NY Homes, Cross river NY Luxury Homes for Sale, Cross River Real Estate for sale on May 18, 2017 by Robert Paul. With the end of 2016 approaching, NAHB’s Eye on Housing is reviewing the posts that attracted the most readers over the last year. In July, Na Zhao examined typical construction durations for various types of single-family homes and regions. The 2015 Survey of Construction (SOC) from the Census Bureau shows that the average completion time of a single-family house is around 7 months, which usually includes almost a month from authorization to start and another 6 months to finish the construction. The timeline from authorization to completion, however, is not consistent across the nation, depending on the housing category, the geographic location, and metropolitan status. Among all the single-family houses completed in 2015, houses built for sale took the shortest time, 6 months to completion after obtaining building permits, while houses built by owners required the longest time, almost a year. Homes built for rent took 9 months from permit to completion, and those built by hired contractors normally needed around 8 months. A large proportion of single-family homes built for sale and on owners’ land built by contractors began construction within the same month after obtaining building authorizations. However, homes built for rent and built by owners had a one-month lag between permits and construction start in 2015. The average time from authorization to completion also varies across the nation. New England division had the longest time of 10 months, followed by the Middle Atlantic of 9.6 months, East South Central, East North Central, and Pacific of 8 months in 2014. These four divisions all had above average time from permit to completion. The shortest period, 6 months, happened in the Mountain division, which also had the shortest waiting period from permit to construction start. The metropolitan status indicates how long it takes to build a single-family home. Houses in metropolitan areas, on average, took nearly 7.5 months to completion, which was 2 months shorter than those in non-metropolitan areas. This pattern was quite consistent across the nation, except for the Middle Atlantic division where the average month to completion in metropolitan areas was longer than in non-metropolitan areas in 2015. The SOC also collects sale information for houses built for sale, including the sale date when buyers sign the sale contracts or make a deposit. In 2015, the share of single-family sold while under construction was 66%, with 32% even sold before construction start and 12% sold during the same month of completion. The percent of single-family houses completed in 2015 stayed unsold at the first quarter of 2016 was only 6%. This entry was posted in Cross River NY and tagged Cross River NY Homes, Cross river NY Luxury Homes for Sale, Cross River Real Estate for sale on January 18, 2017 by Robert Paul. The US Census Bureau and Department of Housing and Urban Development in a joint release reported that newly constructed single family homes sold at a seasonally adjusted annual pace of 593 thousand in September, up 3.1% from a downwardly revised August figure, and up 29.8% from September 2015. However, note the monthly data is volatile and September was the lowest point in 2015 and the second highest point in 2016. Year over year growth in the trend in sales was 9.4%. Downward revisions to the July and August figures in no way diminish the upward trend that continues with the September figures. The inventory of new single family homes for sale was 235 thousand, essentially flat in recent months after modest gains earlier in the year. Prices for new homes rose 3.5% from August and 1.9% from last September. A flat inventory in an environment of rising sales has put upward pressure on prices but expanding inventory has been a challenge given shortages of developed lots and skilled labor (NAHB). Both sales and inventories remain depressed by historical standards but the level of inventory given the pace of sales is in line with historical norms as builders balance caution and available resources in their efforts to meet expanding demand. This entry was posted in Cross River NY, Westchester NY and tagged Cross river NY Luxury Homes for Sale, Cross River NY Real Estate, Cross River Realtor on November 8, 2016 by Robert Paul. Home prices continued their increasing trends continued to increase in July, but at a slower rate than before, according to the most recent report by S&P CoreLogic Case-Shiller Indices released by S&P Dow Jones Indices and CoreLogic. Annually, the National Home Price index showed a gain of 5.1% in July. This is up slightly from June’s 5% annual gain. The 10-City Composite increased by 4.2% annually and the 20-City Composite increased by 5%. Each of these is down from June’s 4.3% and 5.1% for the respective composites. Out of the 20 cities, Portland, Seattle and Denver reported the highest annual gains over the last six months. In July, Portland increased 12.4%, Seattle increased 11.2% and Denver increased 9.4%. After seasonal price adjustment, the National Index increased by 0.4% monthly but the 10-City Composite decreased 0.1%. The 20-City Composite remained unchanged. This entry was posted in Cross River NY and tagged Cross River NY Homes, Cross river NY Luxury Homes for Sale, Cross River Real Estate for sale on October 17, 2016 by Robert Paul. Freddie Mac (OTCQB: FMCC) today released the results of its Primary Mortgage Market Survey® (PMMS®), showing average fixed mortgage rates declining after nudging slightly higher for three consecutive weeks. 30-year fixed-rate mortgage (FRM) averaged 3.43 percent with an average 0.5 point for the week ending August 4, 2016, down from last week when it averaged 3.48 percent. A year ago at this time, the 30-year FRM averaged 3.91 percent. 15-year FRM this week averaged 2.74 percent with an average 0.5 point, down from last week when it averaged 2.78 percent. A year ago at this time, the 15-year FRM averaged 3.13 percent. 5-year Treasury-indexed hybrid adjustable-rate mortgage (ARM) averaged 2.73 percent this week with an average 0.5 point, down from last week when it averaged 2.78 percent. A year ago, the 5-year ARM averaged 2.94 percent. This entry was posted in Cross River NY, Lewisboro and tagged Cross river NY Luxury Homes for Sale, Cross River Real Estate, Mortgage rates on August 5, 2016 by Robert Paul.